A new rat study shows that OxyPower has anti-inflammatory effects on the coronary artery and heart muscle tissue. The introduction of a pathogen the body can induce C-reactive proten (CRP) production, which will attack endothelial cells of blood vessels, among others. This causes blood vessels to become inflamed, restricting blood flow. The inflammation can lead endothelial cells to break, causing scars and plaque. A similar mechanism occurs in heart muscle tissue when inflammation is present. This new study compares the effects of OxyPower and CoQ10 on inflammation in the coronary artery adn heart muscle tissue. In the study, rats were divided into three groups: (A) Control group, (B) CoQ10 group, and (C) OxyPower group. The rats were injected with the pneumonia pathogen (bacteria) to induce inflammation. Groups B and C were given CoQ10 and OxyPower, respectively, for 7 consecutive days. 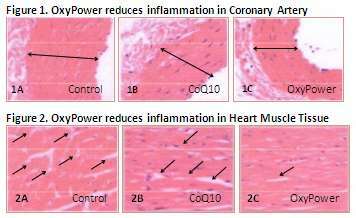 Their effect on inflammation in the coronary artery (Figure 1) and heart muscle tissue (Figure 2) were then observed. Inflammation was clearly evident in the control groups. Figure 1A shows the thickening in the coronary artery while the white sections in Figure 2A indicate inflammation. 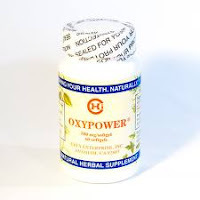 After 7 days of CoQ10 and OxyPower administration, inflammation in both the coronary artery and heart muscle is visibly reduced. Figures 1B and 2B show the anti-inflammatory effect of CoQ10. OxyPower has even more potent anti-inflammatory effect than CoQ10, clearly seen in the reduced thickness of the coronary artery (Figure 1C) as well as in the fewer white areas in the heart muscle (Figure 2C). An 84-year-old man from California had 100% blockage on his left carotid artery due to stenosis. From March to April 2012, he had 8 fainting spells despite taking Coumadin. Then he started taking OxyPower and he never had a fainting spell again. P.C., a 64-year-old man from Arizona, had COPD. For months, he has been using an oxygen tank to breathe easier. He also uses a CPAP machine for sleep apnea. Then he started taking OxyPower. After only a day, his breathing has significantly improved. Two days later, he did not have to use the oxygen tank at all during the day and did not need the CPAP machine at night. He now feels much more energized. For more information on Oxypower, call Depke Wellness as (949)954-6226.